Social media spats such as the Bud Light corn syrup affair dominate Twitter for a few days, but do consumers really pay attention and do they benefit the brands involved? 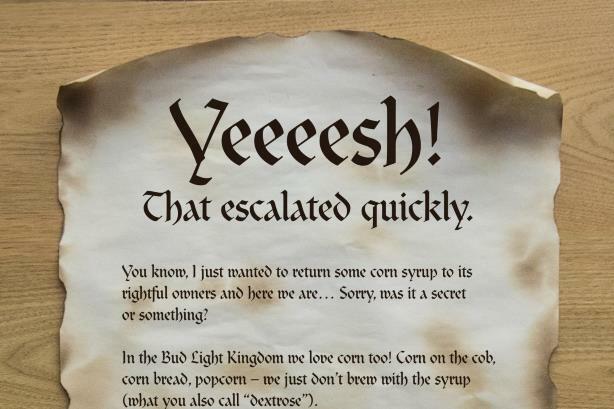 Bud Light kicked off a "corntroversy" with its provocative corn syrup-themed Super Bowl ads. PRWeek is doing more and more stories about brands activating in real time on social media and coming up with clever stunts to stimulate buzz and conversations. And, judging by the traffic stats, you all are very interested and engaged by these storylines and how comms and marketing teams navigate them. Social media is also the place where conversations take place about events that don’t originate on social. Last Sunday’s Super Bowl LIII in Atlanta is a perfect example, as brands shelled out $5 million for lucrative 30-second ad spots in between the soporific football provided by the New England Patriots and LA Rams. Our crack team at PRWeek of @Washkuch and @PRWeekDiana monitored the big plot lines on Twitter as the evening progressed, with brands’ attempts at winning the advertising Super Bowl making up for the lack of significant action on the field. Pepsi, Bumble, Amazon, Michelob Ultra, Audi, Avocados From Mexico, Google, Hyundai, Kia, and The Washington Post were just some of the big spenders seeking the attention of football fans. PRWeek gained direct insight into how one brand marketing and communications team handles this real-time environment of a Super Bowl in a practical sense courtesy of the Burger King crew. But the biggest and most enduring Super Bowl plot line this year seems to have been Bud Light’s Game of Thrones-inspired spots about its rivals’ use of corn syrup in its beer manufacturing processes. The ad creative from Wieden & Kennedy involved the brand’s Bud Knight redirecting barrels of corn syrup that had mistakenly been delivered to Bud sites to MillerCoors’ Miller Lite and Coors Lite medieval kingdoms. Bud Light has seen its sales come under pressure in recent months and has also become irritated at MillerCoors' continuing assertion that it tastes better than Bud Light. So Bud manufacturer Anheuser-Busch InBev turned the argument toward beer ingredients instead and made a clear statement about corn syrup by putting in front and center in its creative, which, rivals said, confused consumers about the nature of the debate by conflating it with high-fructose corn syrup. Bud Light had also just become the first major beer to, voluntarily, list its ingredients on the bottle label. Corn syrup is a form of fermentable sugar used to activate yeast in the brewing process and is consumed out in production and turned into alcohol. High-fructose corn syrup is more typically added at the end of a production process as a sweetener or finisher, and stays in the drink. A-B InBev does use the high-fructose syrup in some of its products, MillerCoors doesn't. These semantics are probably beyond the level of detail the average beer drinker needs, or wants, to know, but it turned what was set to be a relaxing night in front of the TV watching the big game into a very busy evening for National Corn Growers Association VP of comms Neil Caskey. To be fair, the association’s small team convened quickly and pushed back swiftly on Twitter. A new romance was born between the trade group for corn farmers and MillerCoors, with the brewing giant's eponymous chairman Pete Coors speaking at the association’s convention in Denver on Tuesday. It enabled the brewer to position itself as a friend of downtrodden U.S. farmers in America’s heartland, a semi-mythical and much-eulogized group in its own right. The corntroversy escalated as the week progressed, with MillerCoors taking out a full-page ad in The New York Times and Bud Light calling out the rival brewer’s genial chief public affairs and communications officer Pete Marino on social media, dubbing him "ye old(sic) CCO" of @MillerCoors and telling him to stop stalking them. Marino had suggested Bud itself uses corn syrup in the production of some of its beers – which it does. A-B InBev responded by saying it uses rice in the production of Budweiser and only uses corn syrup in the production of value brands. Ironically, another A-B InBev brand, Bon & Viv Spiked Seltzer, was also among the lineup of Super Bowl advertisers and it is manufactured using a "blend of cold-fermented corn sugar" (i.e. corn syrup). Other company products brewed with corn syrup include Natural Light, Natty Daddy, Busch Light, Stella Spritzer, Red Bridge, and Bud Ice. I'll leave others to decide whether these qualify as "value brands". As well as giving everyone the opportunity to wheel out endless corn puns – corntroversy, earful, kernel, and so on - the whole episode raises lots of questions and issues that are super relevant to communicators. Should your – very expensive – marketing draw attention to rival brands or is that just gifting free publicity to them? How should you respond when a competitor takes direct aim at you? Where do you draw the line in terms of continuing a debate on social media? At what point should the "aggressor" (Bud in this case) cease the conversation, because of the risk of being seen as petty, aggravating, and annoying? All of these issues are top of mind for communicators and social media war room operators as they navigate the new world of storytelling, which can start with paid media, spill over into shared/social, continue through earned coverage, and utilize owned media channels as a space to make your own case unencumbered by third-party influence. The definitive playbook has certainly not yet been written, but the principles of good PR practice and reputation management are just as relevant in this milieu as any other – and that’s just plain "cornmon sense".